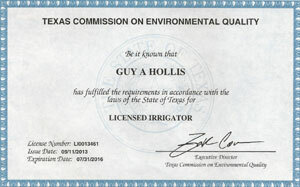 Dallas Landscape and Irrigation Inc. is a multi services firm. We offer the highest quality Residential and Commercial Sprinkler System Installation, Sprinkler System Repair, Sprinkler Upgrades, Foundation Drip Systems and Backflow Prevention Testing of Hospitals, Medical Buildings, Restaurants, Warehouses and Lawn Sprinkler Systems. Dallas Landscape and Irrigation has been an industry leader in the lawn sprinkler system installation and sprinkler repair market for years. 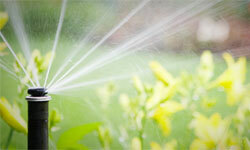 There is a 90.00 Service Charge to review sprinkler systems for any sprinkler repairs . Dallas Landscape and Irrigation provides Backflow Prevention Testing Certification for Hospitals, Medical Building, Restaurants, Warehouses, Ice Machines and Lawn Sprinkler Systems. We ensure our Sprinkler System Installations, Sprinkler Repair and Backflow Testing Certification Services are the Best in the Dallas, TX Metorplex. View the Testimonials page. New Irrigation Technologies to help conserve water. We guarantee 100% (head to head) coverage. Watering schedule for the whole year. Sprinkler repairs require 90.00 service charges for evaluations or yearly Checkups. Irrigation System Installation, Sprinkler System Installation, Sprinkler Repair and Backflow Testing of Hospitals, Medical Building, Restaurants, Warehouses and Lawn Sprinkler Systems . We have decades of experience in the lawn irrigation, sprinkler system installaton, sprinkler repair and backflow testing. Our qualified staff members have the ability and skill to meet your needs.